The high performance luminaire is designed for recessed applications where long life, low maintenance, and consistent color rendering is required. Areas with limited accessibility due to fixture location or where heavy pedestrian traffic makes maintenance difficult are ideal applications such as retail canopies. The heavy duty housing is constructed of extruded aluminum. The optical assemblies are sealed in place using a silicone gasket for weather tight protection and prevent dust, debris or insects from infiltrating the LED module. Spring locks securely hold the LED brick in place. ETL listed for damp locations. 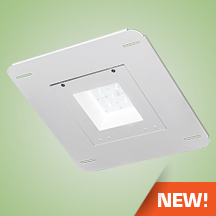 LED Module IP65 rated. A Super Durable Polyester powder coat finish is electrostatically applied in our state of the art paint facility. Standard colors available: White. Custom colors available upon request. Made with a state of the art UV stabilized acrylic high performance refractive optical assemblies that use high transmissivity materials to achieve precise photometric distributions. Available in Type V Medium beam configuration. The recessed optics eliminate glare. Available in 5000K-70 CRI Cool White (+/- 500K) or 4100K-70 CRI Neutral White color temperatures propagated with Philips Lumileds Luxeon MX LED’s. Consult factory for high CRI (90+) model availability. Available with 100-300V 50/60 Hz 90°C rated power supply. LED’s rated for over 50,000 hours at 25°C ambient temperature. 347V~480V input option available. 0-10V dimming. 10 kV surge protection provided. Built-in Active PFC Function >95%/Full load. LED Power Supply conforms to UL8750 standards and is IP67 rated for wet locations. The fixture is recess mounted using the fascia plate provided for rough-in. Door/LED assembly utilizes quick release hinges to allow the fascia plate to be mounted first. Door/LED assembly may then be attached to the fascia plate and wiring connections made. Two (2) quarter-turn latches holds the assembly firmly in place. Available for New Construction or Retrofit applications. ETL listed for damp locations. Meets US and Canadian safety standards. -40°C to 40°C ambient operation. RoHS Compliant.